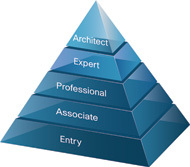 Cisco offers five levels of network industrial certifications. (see the pyramid) More detailed information on www.cisco.com/certification. A student of Cisco Netacad can learn the necessary knowledge upon completion of CCNA1+CCNA2 courses. Next Cisco Netacad courses- CCNA3+CCNA4 cover the requirements of commercial certification exam Interconnecting Cisco Networking Devices Part 2 ICND2. (200-105 ICND2). Associate level = ICND1+ICND2 = CCNA cert in Routing & Switching. (200-125 CCNA). This is the composite exam (200-125 CCNA) , that we recommend to our students after completion of all four CCNA1-CCNA4 courses. Practical skills are tested by simulations , testlets and simlets. We recommend to watch an original Cisco DEMO. Validity of CCNA/CCNP commercial certificates is 3 years.